Another season, another wreath makeover here at Two It Yourself. If you haven't caught on by now, I prefer to shop my home over the store and last week I went shopping. Last week's hoist included this spring wreath. It's seen better days on my front door, but I wasn't ready to completely let her go so I gave her a makeover. The wreath is now hardly recognizable, but the job was a pretty easy one. I removed about 85% of the flowers on the wreath to expose most of the grape vine. I removed all the blue hydrangeas and most of the white. I did, however, leave a small group of white flowers that were all grouped together. 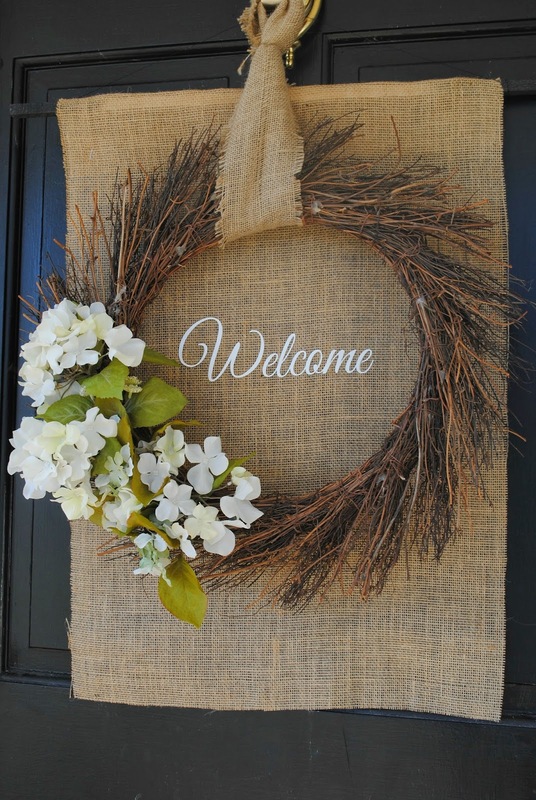 Once I had everything I wanted off, I filled back in the with a few extra white stems and added a burlap hanger. My original plan was to put a moss covered monogram on the opposite side, but it just wasn't speaking to me. Somehow the wreath I found on Pinterest, that had originally inspired me, just worked better...something wasn't quite right on my version. I cut a piece of burlap, folded over the top and sewed it closed to make a pocket for a dowel. When I put the wreath in front of it I still wasn't feeling it. For one thing, I didn't like that I could see the unfinished dowel. 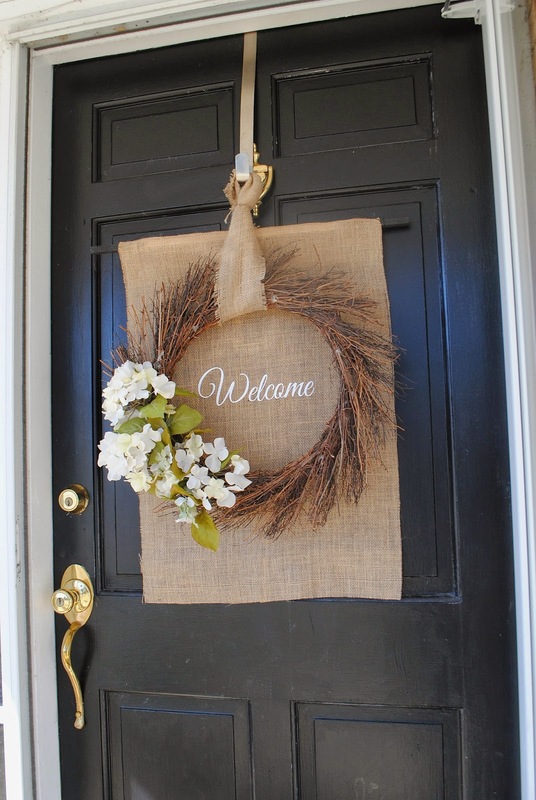 I fixed that by spray painting the ends black and using black floral wire to hang the burlap piece. Even after those changes, I still felt like something was missing. 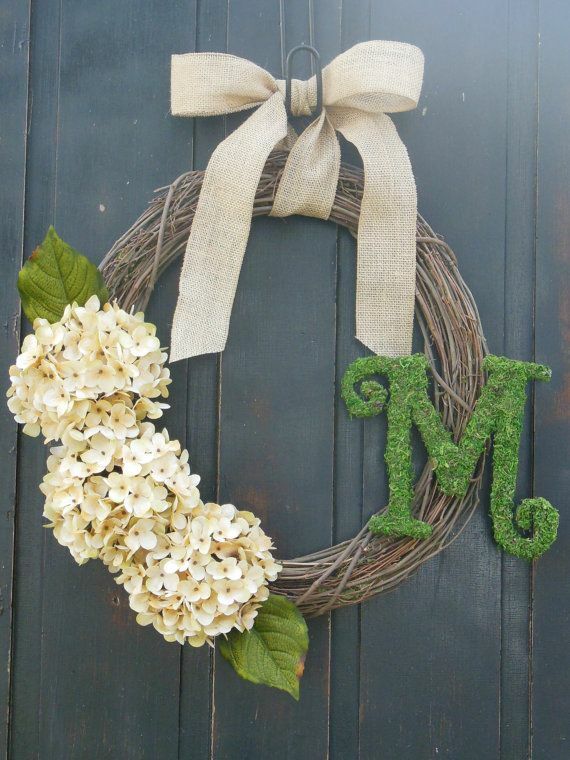 I took it to my Instagram followers who agreed I needed something - perhaps a monogram - inside the wreath. You know me and monograms are BFFs, but this time I went in another direction and instead used my Silhouette to cut 'Welcome' (Great Vibes font). It's just what my spring wreath needed..and now I love it! It's something different and unique and most importantly...springy.